Brazil’s top electoral court confirmed the congressman’s victory after he won with 55.5 percent of the vote. He now becomes the new president of the world’s fourth-largest democracy after defeating leftist Fernando Haddad, a former Sao Paulo mayor. Reacting to his victory in a video transmitted from his home in Rio de Janeiro, the 63-year-old said: ‘I first want to thank God. This is not the promise of a party, nor the word of a man. It is an oath before God. 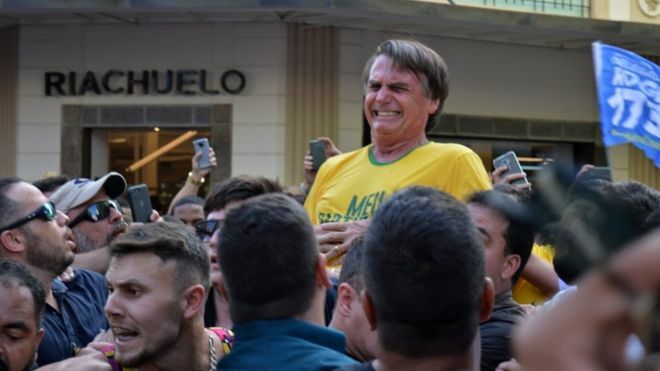 Back in September, Bolsonaro was stabbed during a campaign rally in the southern city of Juiz de Fora. The politician survived but was seriously injured and underwent surgery. Read previous post here. The new president will be sworn-in on the 1st of January 2019.